WALTHAM, Mass.--(BUSINESS WIRE)--Uptycs, provider of the first osquery-powered scalable security analytics platform, today steps out of stealth having raised $10M in a Series A investment led by ForgePoint Capital and Comcast Ventures. 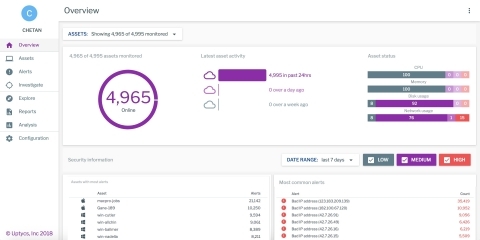 The Uptycs security analytics platform expands on osquery, a universal open source endpoint agent, to enable unified fleet visibility, intrusion detection, vulnerability management and compliance across Linux, macOS, Windows, containers, and cloud workloads. Uptycs plans to use the funds to fuel rapid hiring and continued product innovation, with plans to release additional dashboards for Vulnerability Management and Compliance in the coming weeks. The Uptycs leadership team has decades of collective experience in building software systems that are highly reliable, efficient and scalable. That, coupled with many years on the front lines of cyber security and success in leading early stage companies, uniquely positions the team to execute on their transformative vision. Comcast Ventures, Genacast Ventures and Founder Collective previously provided a $3M seed round. Uptycs continuously monitors and records system activity transforming it into context-rich dashboards, reports and alerts for fleet visibility, intrusion detection, vulnerability management and compliance for modern computing environments. Uptycs offers the first scalable security analytics platform powered by osquery, an open source universal endpoint agent. Uptycs, provider of the first osquery-powered scalable security analytics platform, today steps out of stealth having raised $10M Series A investment.